NEW Location: Between MAC Cosmetics and Joseph's Hairstyling, by Entrance 1 (Kelsey's & Baxter's Landing). 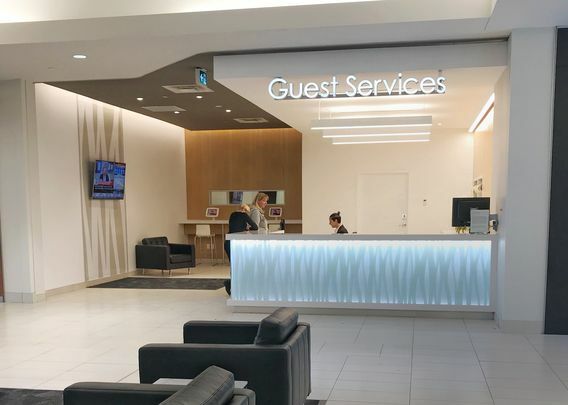 Oshawa Centre Guest Services is committed to making your shopping experience a happy one! Have a little car trouble in our parking lot? Not to worry! Visit Guest Services and let them know. We offer various ‘light duty’ services including boosts, spare tire change, and emergency fuel delivery to name a few. 1. Shoes and proper attire must be worn when on property. 2. Proper behaviour is required. Soliciting or canvassing is strictly prohibited. 3. Engaging in any unlawful activity or behaviour is not permitted. 4. Bicycles, skateboards, rollerblades or other similar equipment may not be used within the facility. 5. No animals are permitted within the mall, with the exception of properly identified and/or licensed service animals. 6. Smoking or use of electronic cigarettes is permitted in designated exterior areas only. 7. The consumption of cannabis by any means (including smoking and vaping) is not permitted anywhere on the property, both inside and outdoors. Oshawa Centre (including office complexes, parking facilities and exterior property) is privately owned. Parking rules may be enforced, and all activities may be monitored by surveillance equipment.